A Toronto Food Tours uniformed guide will be waiting for you when you arrive at the south-west corner of Dundas St. and Spadina Ave. After a brief walk through old Chinatown, you'll enter Kensington Market. Here your guide will give you a short Toronto history lesson before leading the way to the first of six stops at local eateries. First up, you will get to try a Torontonian snack time favorite that comes in over 50 flavors. Your guide will even buy you a bag of your favorite flavor to take home so you can enjoy it after the tour! Then it is off for a quick photo op with the beautiful downtown Toronto skyline as your backdrop. Up next, you'll taste Toronto's latest food trend before heading to a hole in the wall shop run by a husband and wife team for what is undoubtedly the best jerk chicken in the city. 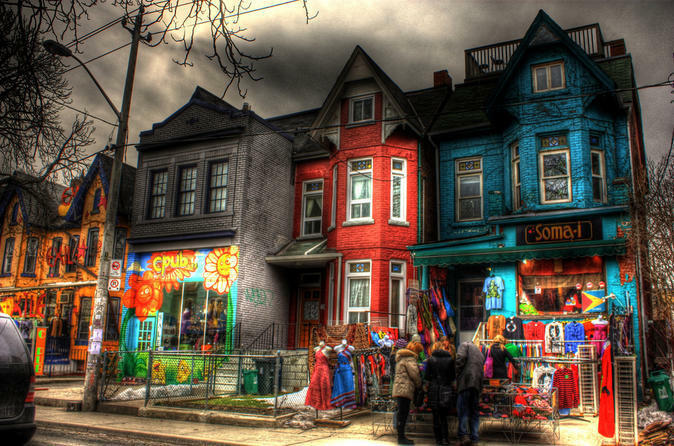 The tour continues with stops for Caribbean, Latin American, and Canadian comfort food while your guides share stories of the neighborhood and shows off the vintage shops and multicultural merchants. A visit to the Lopez families restaurant finds you feasting on authentic Mexican Tacos and frozen margaritas. To satisfy your sweet tooth, you will stop by a bakery whose owner has been baking pies since she was 9. Last but not least, it's off to find that secret bar and enjoy a local craft beer or glass of Ontario wine.